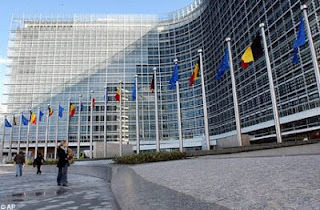 US news paints a concerning picture of eurozone stability and the future of the European Union. We are often faced with headlines such as: “Can the EU Survive Europe’s Crisis?” , “The European Union is Falling Apart”, and more recently “The Euro Crisis: Back to the Brink”. From within this environment of concern and uncertainty, a group of teachers, politicians and a journalist ventured out, beyond the US to two European capitals, and the heart of it all: Brussels and Luxembourg. Amidst the eurozone crisis, emergency EU summits, and geopolitical instability, we found ourselves in the center of the largest political and economic challenge of this author’s lifetime. During our trip, I kept my eye out for answers to the questions being asked at home: will the eurozone remain intact, will the EU stay together, or will the EU shed its weakest members? The uncertainty left me eager for answers, and in search of the true political climate in the eye of the storm. The EU began as a coal and steel union (European Coal and Steel Community) after the world wars, with the purpose of creating security and prosperity for Europe. Eventually becoming the EU, the heart and soul of the union remained in one place: Brussels. It was fitting, then, that we began our study tour in the Grand Place in Brussels, a medieval display of European commerce and economic unity. From a thriving 11th century market place transformed into a 14th century architectural marvel by various local guilds, the Grand Place represents the early commercial development of Europe. 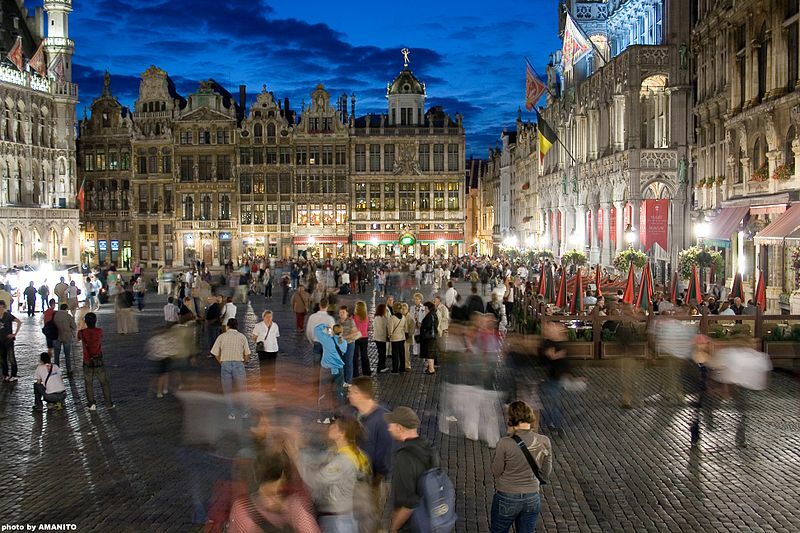 Today, it is a vibrant area full of tourists enjoying Belgian chocolate, Belgian beer, and the beautiful historic sites, all with thoughts of the future of the EU on their minds. Our trip offered us the opportunity for a better understanding of the EU through a series of presentations at the European Commission. The study tour happened to coincide with the crucial June EU Summit, which left us all with many questions. One presenter in particular, Jakob Bork, was able to feed our appetite with a stimulating discussion providing answers that had yet to be revealed. Receiving the scoop about why countries really want to join the EU, what power the Council of Ministers really have, and the real financial issues underlying the current economic concerns, I came away feeling I had just been given an insider’s view of the inner workings of the EU. We also visited NATO headquarters the very day Turkey came to NATO requesting to invoke Article 5 by asking for intervention against Syria after an attack on their military planes (Turkish F-4 Warplane ‘Shot Down’). With all the buildings bustling with this energy, we sat down to listen to two speakers inform us on their views of NATO’s mission and NATO’s place in the world. NATO’s new mission statement (see NATO’s New 10-Year Mission Statement) underscores the goal of EU security. Given the current economic crisis, NATO has become a central instrument in helping to provide security while alleviating some of the economic burden of a independently, fully funded state defense program. This cooperation is everything the EU itself stands for: increased interdependence as a means of lasting European peace. And yet, in this economically strained climate, I found myself wondering if the political and social pressures will allow the cooperation to continue? And, as Europe emerges from this crisis, will the EU have new expectations of NATO? 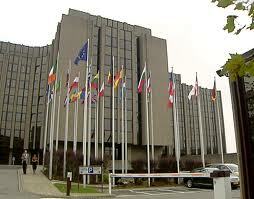 The European Court of Auditors provided another interesting window into understanding the EU. Our presenter, Jussi Bright, laid out ECA’s history and responsibilities as an institution structurally independent of the EU. Each EU budget line item is audited here. Mr. Bright highlighted the financial challenge of a global political entity with 23 official languages. The simple need to print all findings and reports in all the languages makes the need for an increased usage of e-technologies paramount. In regards to the current economic climate, Mr. Bright pointed to the countries themselves: the responsibility of each EU state to have controls in place that to manage their own economies and reinforce healthy fiscal policy. Here we begin to understand the current limits of EU influence over their own members. Our study tour took place during an exceptional time in history, and gave us a firsthand view of what the future might hold for the European Union. 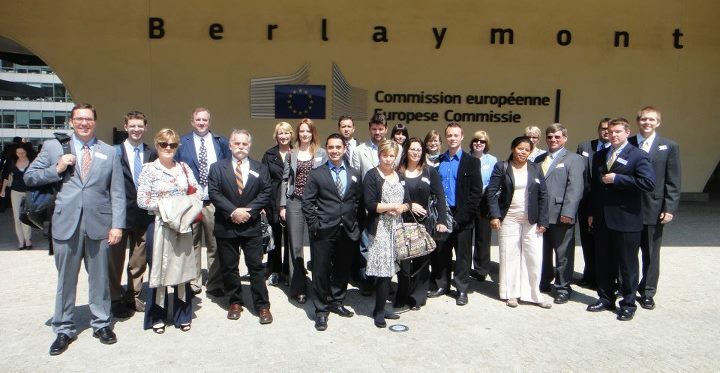 From the trip emerged a group of individuals who gained an exceptional amount of knowledge about the inner workings and vision of the EU. And like the EU, which will come out of the current crisis more equipped to take on future challenges, we are now better professionals for having had the experience. Thank you EU CENTER! Letitia Zwickert teaches Cultures of the World and International Relations courses at Naperville Central High School in Naperville, Illinois.